Our Stationery Shop is constantly updated with high-quality stationery supplies for your business. Whether you're seeking school stationery or professional looking office stationery supplies, you'll find it all right here. For larger businesses, we can provide larger quantities of the most essential items, including pens, pencils and paper. 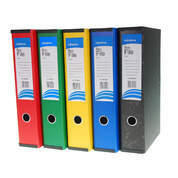 And if you work in education or an office, we have a range of files and folders for teachers available to browse online today. Find the perfect wholesale stationery supplies right here at Gompels.